Most newborn piglets rapidly become iron deficient, leading to anemia, failure to thrive, and potentially elevated mortality levels, with significant negative economic implications for the producer. For many years now, injectable iron has proven a relatively economical and effective approach to correcting iron deficiency and anemia in piglets. 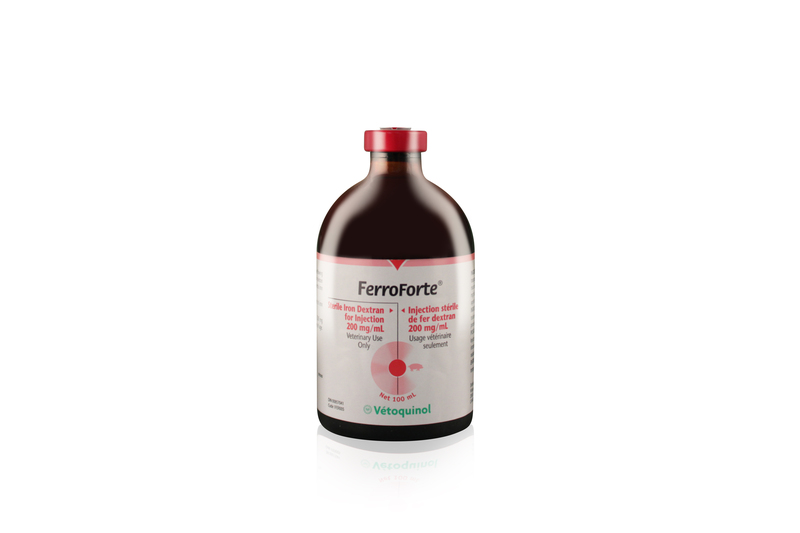 FerroForte is a clear, free flowing, dark brown solution containing a macromolecular dextran and iron complex containing 200 mg/mL elemental iron with 0.5% w/v phenol as a preservative. Inject 1 mL (200 mg iron) intramuscularly at 1 to 3 days of age. Disinfect the injection site.